Virginia Region, USA celebrated the Promised Messiah Day with great zeal. The day began with Fajr prayer in the mosques of the region followed by dars. Young Khuddam, Atfal and members of Ansarullah travelled to the city of Richmond (the capital of Virginia) to hand out the Messiah Has Come flyers to the neighbours of Masjid Anwaar. Local members of Lajna Imaillah and Nasirat of Richmond Jamaat helped in preparing the flyers for this momentous occasion. As a result of these humble efforts, 3,200 local homes were visited before Zuhr prayer, thereby conveying the message of the Promised Messiahas on the day of the first Bai‘at in the time of the Promised Messiahas to about 10,000 fellow Virginians. Alhamdolillah. After the tabligh programme, members congregated to celebrate the Promised Messiah Day at the recently inaugurated Masroor Mosque in the city of Manassas, Virginia after Asr Prayer. More than 325 members of the local Jamaat participated in this Jalsa. There were 3 speeches around the life of the Promised Messiahas.Regional Missionary Imam Faran Rabbani spoke on the men who accepted the Promised Messiahas. The speech presented stories from the lives of such companions of Hazrat Ahmadas who prayed to Allah and were shown that Hazrat Mirza Ghulam Ahmadas was indeed from God. Following that was another Jalsa, this time at Masjid Mubarak in Chantilly, Virginia right after Maghrib. 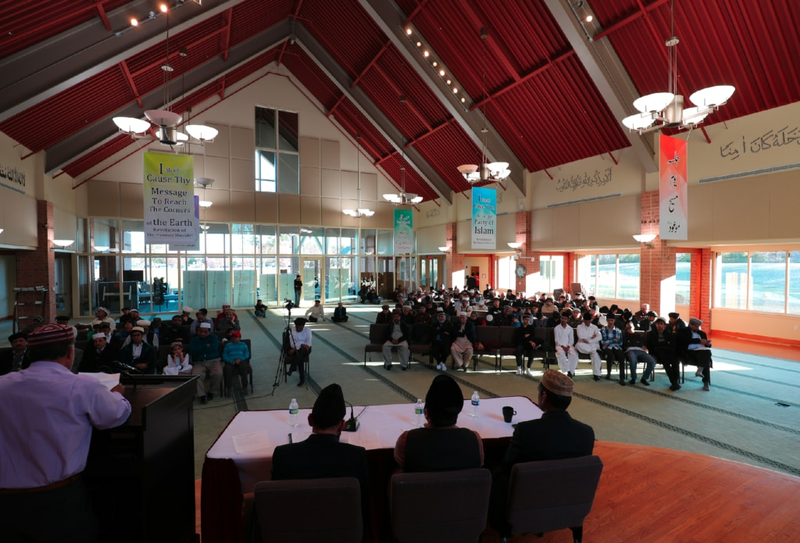 The event brought the highest attendance at any local event at this masjid with about 500 members attending from the local Jamaats of Northern and Central Virginia. There were two main speeches and a video presentation. Regional Qaid Majlis Khuddam-ul-Ahmadiyya Haris Raja Sahib spoke about the teachings of the Promised Messiahas in light of the book Noah’s Ark, reminding everyone of the responsibilities of our Bai‘at, while Imam Faran Rabbani spoke on the topic of the companions around the Promised Messiahas.